Our friends at Texas Armoring Corporation will now be the stars of Family Armor — a new TLC reality show in the style of American Chopper but with AK-47s and explosions. We were impressed with the work TAC does when we took a trip to their shop. We had fun deploying smoke screens, setting off sirens, and accidentally pulling the trigger on a gun pointed at a finished car (thankfully, it wasn't loaded). What we didn't notice was the sort of family rivalry that makes the Teutels bad people/good television. So how will the armored car-suppliers supply the requisite amount of ridiculousness that makes reality TV run? We're guessing it's the clients. We've heard some tales and we believe anyone who is afraid of getting an RPG in the face is probably more interesting than your average custom car buyer. In fact, TAC's own Jason Forsten promised "We won't be the next Jon & Kate," which is exactly what the original Jon & Kate probably thought, too. Press Release: San Antonio's Texas Armoring Corporation Stars in TLC's Newest Reality Show: "FAMILY ARMOR"
AN ANTONIO—(BUSINESS WIRE)—Texas Armoring Corporation (TAC), the world leader in lightweight armored passenger vehicles and bulletproof cars, announced today that it has been cast in TLC's newest reality TV special entitled, "FAMILY ARMOR." The show, which has been carefully paired with network favorites like "Street Customs" and "American Chopper," has been described by industry insiders as "the ultimate guy show" and will offer audiences an entertaining mix of cars, guns, and gadgets that would rival any 007 James Bond film. President and CEO of TAC Trent Kimball commented, "‘FAMILY ARMOR' will give the world a bird's-eye view of our business, our family, and our faith. TLC is a family-oriented network, and we're excited to partner with a group that will reflect well on our work, community, and personal lives." Kimball, who is an Alamo City native, started Texas Armoring Corporation in the 1990s while in his early twenties to help meet the protection requirements of celebrities, heads-of-state, business owners, and VIPs in the United States and throughout the world. Since that time, the business has grown to receive worldwide recognition as a quality leader in the armoring industry. Kimball currently resides in Northern San Antonio with his wife and six children and manages business operations at TAC alongside his brother-in-law, Jason Forston. Forston, Executive Vice President of TAC, said of the show, "Without a doubt, ‘FAMILY ARMOR' will be an amazing piece of television. It works on so many angles - while guys will love the cars and explosions, it's also a clean and entertaining show that the entire family will enjoy." The show will follow Kimball and Forston as they work together to "run a cutting-edge vehicle bulletproofing business in Texas while juggling fatherhood and faith." Kimball concluded, "‘FAMILY ARMOR' will air on Thursday, November 19th after ‘American Chopper' at 10/9c. Check your local listings and be sure to set your DVRs - it's something you, your friends, and family definitely won't want to miss!" Deep in the heart of San Antonio, Texas Armoring Corporation (TAC) turns everyday cars into bulletproofed, bomb-resistant, gadget-filled fortresses, equipped with cutting-edge getaway gizmos and futuristic protective devices that rival those of any 007 James Bond film. Brand new cars direct from the dealer are torn apart piece-by-piece and then rebuilt - stronger, safer, smarter, and sexier. Led by charismatic Trent Kimball and his savvy brother-in-law, Jason Forston, TAC is aided and abetted by a motley crew of expert engineers. When not at the factory, Trent is the father of six rowdy children and married to his live-wire of a wife, Courtney. Jason and his lovable wife, Lacy, are first-time parents to a rambunctious one-year-old. Trent and Jason devote their time to work, family and faith . . . and along the way they get to shoot guns and blow things up all in the name of "business." 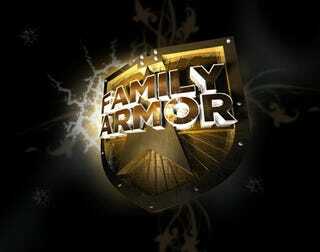 "FAMILY ARMOR" is produced by STILETTO Television for TLC. Executive Producers for STILETTO Television are Mark Grove, Garry Kief, Troy Queen and Tim Warren. Texas Armoring Corporation is the leading worldwide supplier of lightweight armored passenger vehicles, bulletproof cars, cash-in-transit vehicles, armored SWAT trucks, and custom luxury limousines. Texas Armoring specializes in lightweight armor, superior protection, remarkable finishing, and comprehensive support. The firm's origins date back to the 1970s when key staff members pioneered the luxury bulletproofing industry through producing bulletproof cars for world leaders. For more information on armored vehicles and Texas Armoring Corporation, please visit http://www.texasarmoring.com or call 210-333-0211.